Klaxxons rang as the warning spread through Ranger Station Agate, "Dominators invading Hese!". With the new engine upgrade, Hese was within a single jump, so I responded to the call to assemble for the defense. 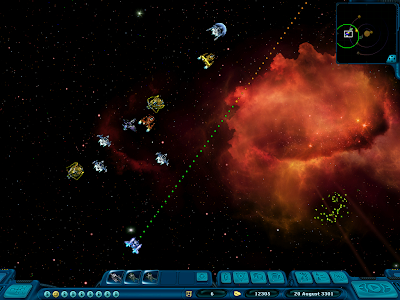 A scan of the battlefield on exit into the Hese system revealed we may have the upper hand. 13 system defense battleships still remained, with 5 other rangers rushing in to help against a meagre 2 urguants and a smattering of smaller ships. The battle was over before I got there, and the remnants of alien technology were being scooped up by an increasing number of rangers. I managed to claim 38 tonne of nodes and 2 intact devices as the flotilla of scavangers, now numbering over 10, headed back to the scientific base for compensation.